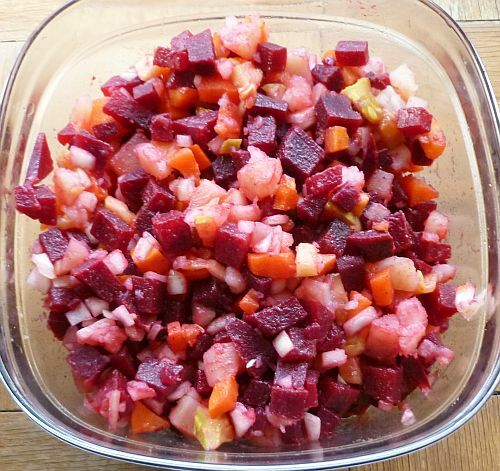 Russian Beet Salad is made from root vegetables and pickles. This is a recipe that could be made even during the coldest Russian winter from vegetables stored in the cellar. Although the name "Vinegret" sounds like the French salad dressing "vinaigrette", it is actually a salad that contains vinegar and oil. Cook the beets in boiling water until tender (about 20 minutes). 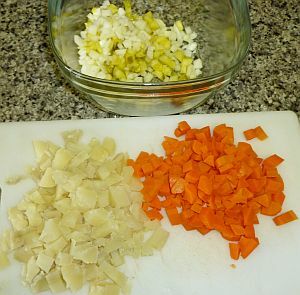 Separately, boil the carrots and potatoes until they can be pierced with a paring knife (about 12 minutes). 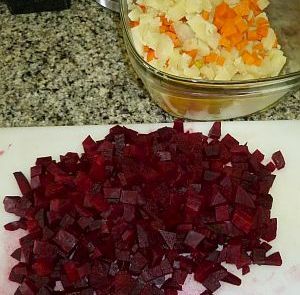 You have to boil the beets separately from the carrots and potatoes because they have different cooking times. Boiling the beets separately also keeps the potatoes from becoming red like the beets. Monitor the potatoes carefully. If the potatoes are overcooked, you will not be able to dice them. Dice all the cooked vegetables into small cubes. 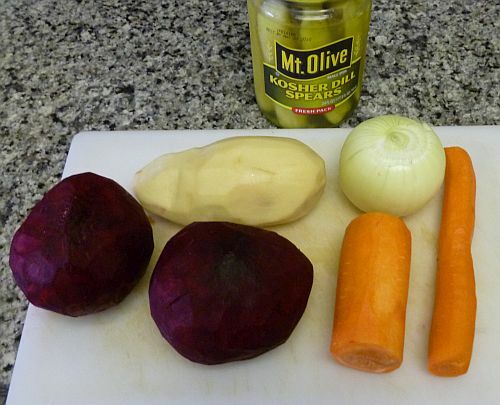 Chop the pickles and the onion. Mix all the vegetables in a large bowl. Season to taste with salt and pepper. Add the oil and the vinegar. Mix to combine.